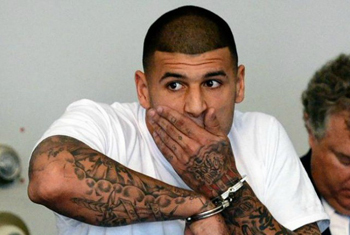 New England Patriots ex-tight end Aaron Hernandez was arraigned on May 28, 2014 for the murders of two men he met in a Boston nightclub in July of 2012. Now Hernandez’s cousin, Tanya Singleton, has been charged with criminal contempt of court for refusing to tell officials what she knows about her cousin’s alleged role in the killing of the two immigrants. In June of 2013, officers tracked a silver sport utility vehicle to Singleton’s garage where it was found covered in cobwebs. This was the vehicle that Hernandez was allegedly driving the night of the nightclub murders. After pleading not guilty to the contempt charges, Singleton, who is battling breast cancer, was ordered to remain in her Connecticut home wearing a GPS monitoring device and must check in weekly with probation officers, according to Suffolk District Attorney Daniel F. Conley’s office. First Assistant District Attorney Patrick Haggan said Singleton expressed concern that her testimony could potentially lead to criminal charges against her, leading prosecutors to offer her immunity in return for her testimony. Aaron Hernandez’s cousin pleads not guilty in Boston, from the Boston Globe. Ex-Patriots TE Aaron Hernandez pleads not guilty to all charges in 2012 murders that DA says were sparked by a spilled drink, from the Daily News.